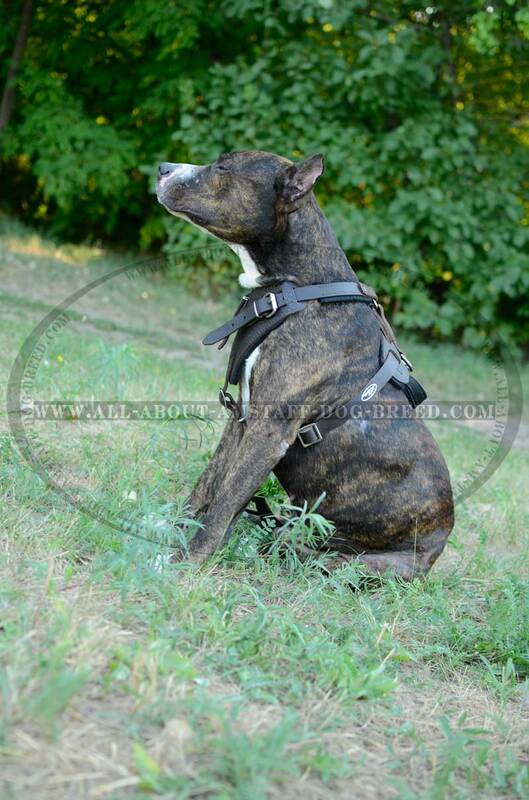 You are the owner of the Amstaff dog Breed and want to purchase for him the best training equipment in the world? 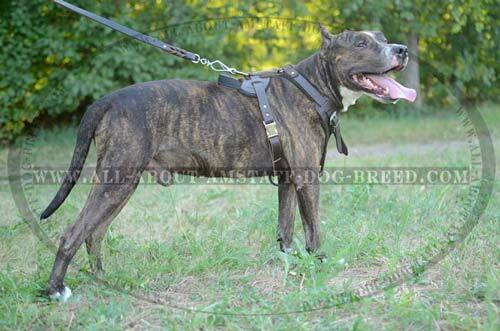 Then, you are on the right way. 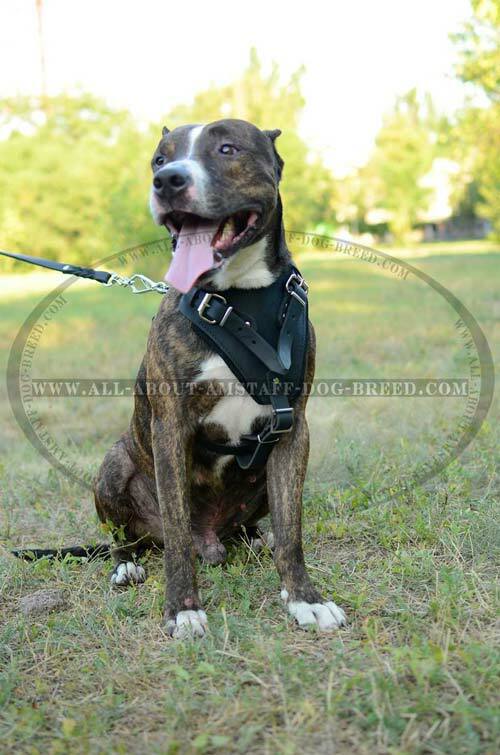 The most popular tool for training the Amstaff dog is a harness. 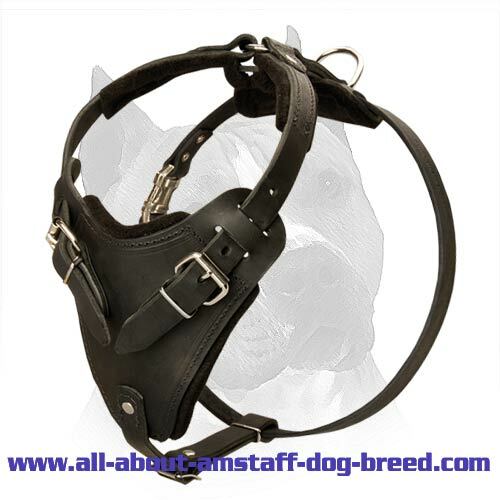 Our company can recommend you The Best Handcrafted Leather Harness for training your lovely pet. 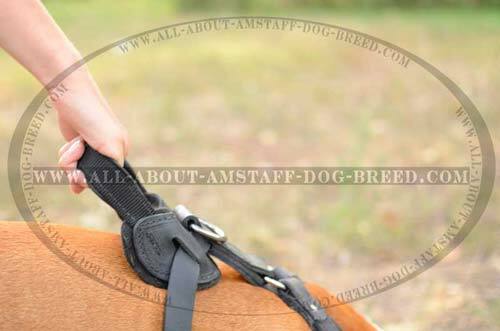 It is a high-quality supply that provides your dog with more comfort while training or walking. 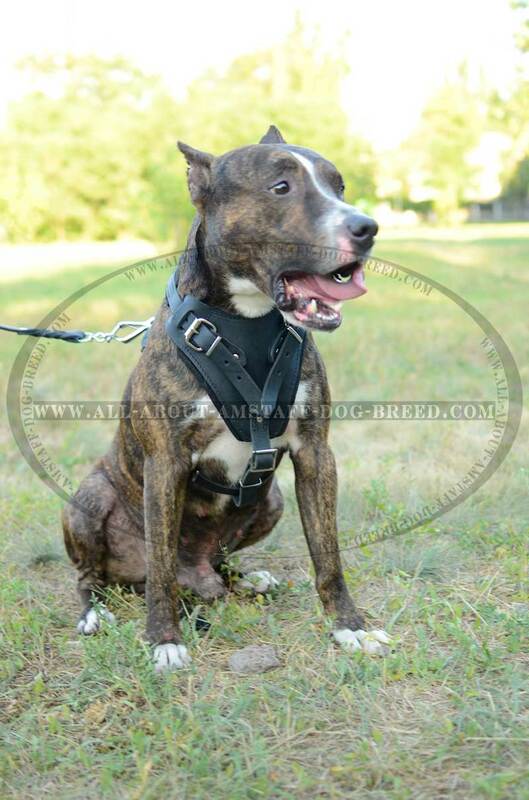 Your lovely pet will be able to bark or pant while training or walking and nothing will bother him. 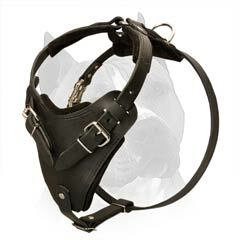 This harness prevents the dog’s skin from rubbing or any irritation. It is equipped with a special soft felt padding in the dog’s chest plate. With this perfect harness your Amstaff dog will not feel discomfort while performing different activities. 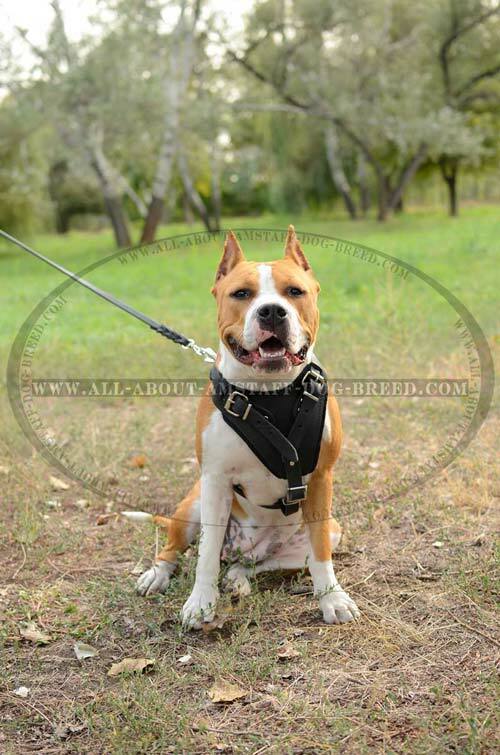 Choose this best supply for your Amstaff dog and you will never regret. 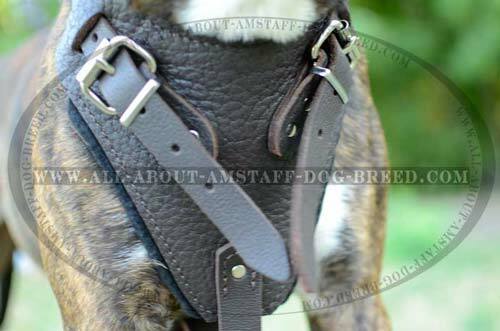 This fantastic dog harness is made of high-quality leather. It is very strong and absolutely safe material that will provide your dog with more comfort while training or walking. The main advantage of this harness is that it helps to release the dog’s neck from pulling stress power and distribute it evenly over the chest area. 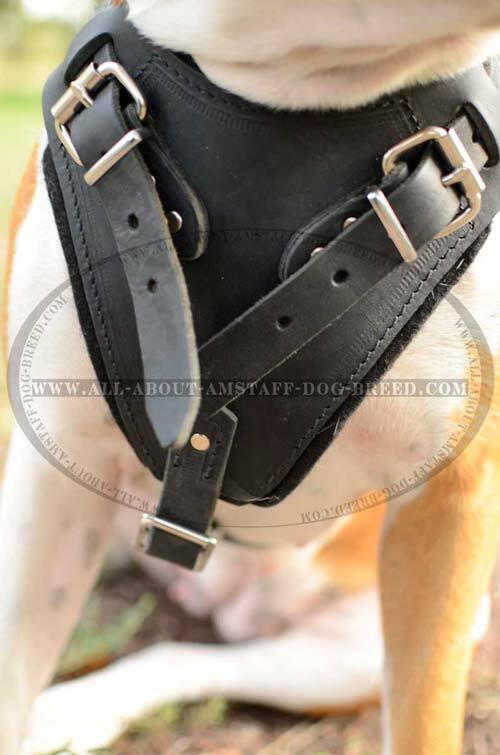 All interior parts of the harness are equipped with a soft felt padding that protects the dog’s skin from rubbing or any irritation. It is non-toxic supply and will not probably provoke any allergy. There are special easy adjustable leather straps that help to fix the harness on the dog’s body properly. 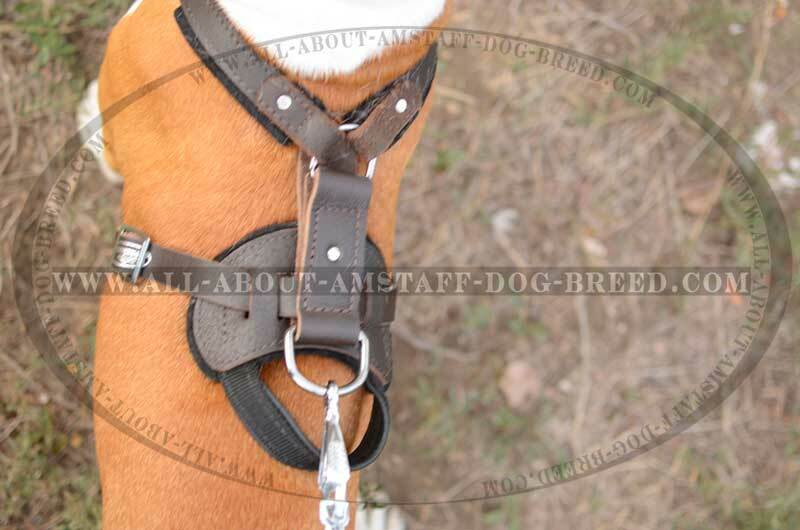 You can regulate these straps according to the dog’s fit. 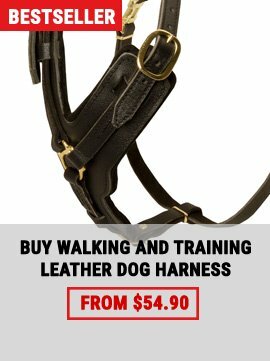 For the harness to be easy in use our craftsmen created special steel nickel plated buckles and a quick release buckle which help you to save your time while gathering for a walk or training. 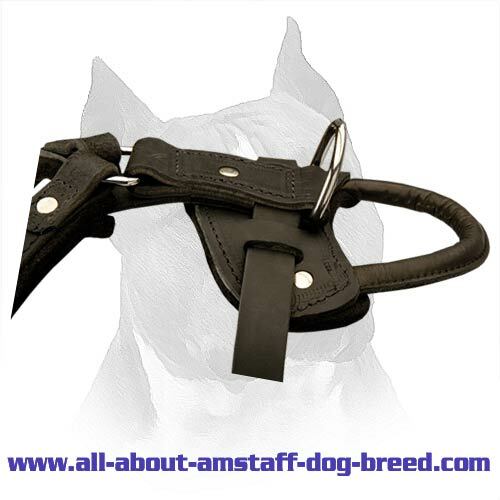 With a help of the special D-ring in the upper part of the harness you will be able to attach a leash very fast and easy. 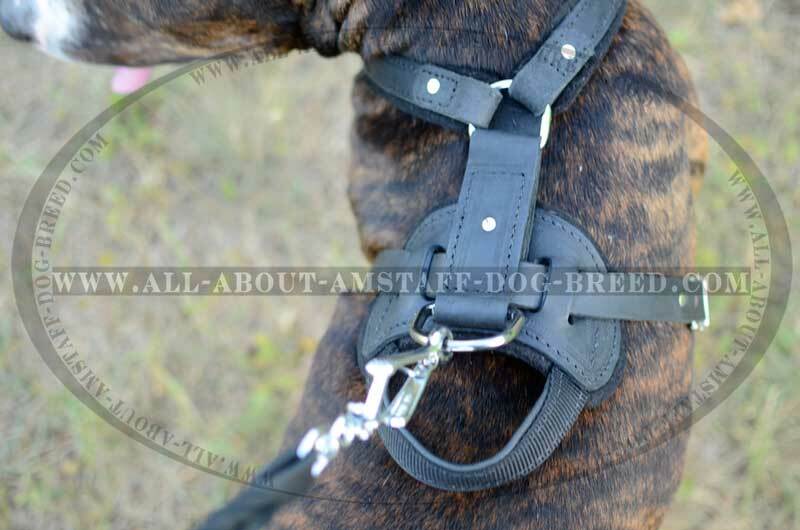 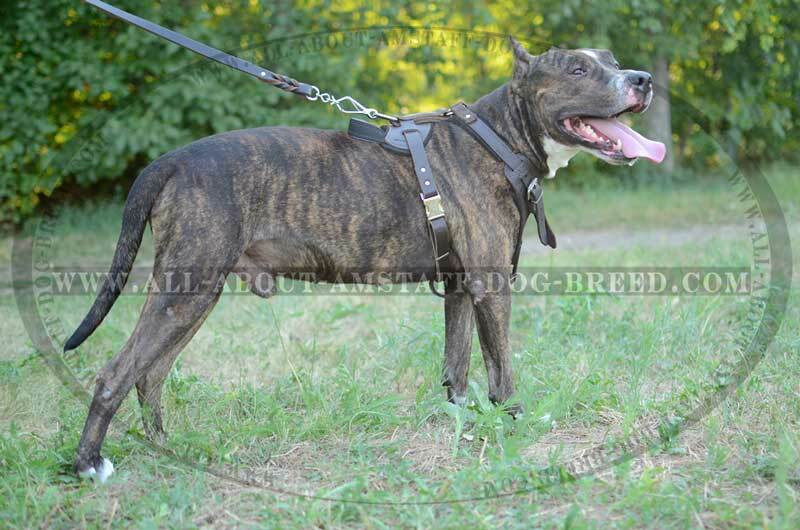 Also, the harness has an extra strong handle which you can use while off-leash training to control your Amstaff dog. 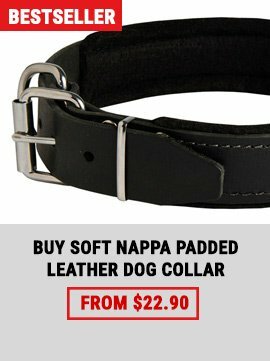 It is an additional option that you can order if you want. 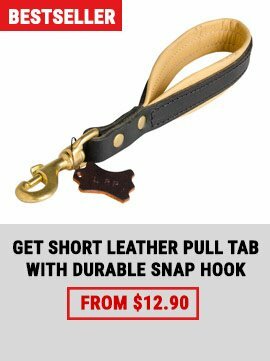 This handle is an indispensable thing for the dog transportation when you need the dog to sit next to you. 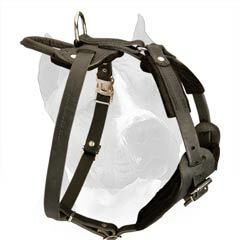 A special stitching and riveting of the harness make it more durable and extraordinary designed. 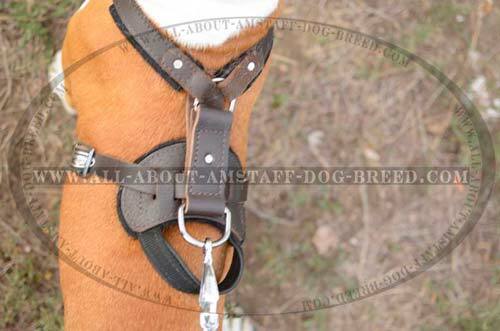 This wonderful product is very popular among our customers. That is why, don’t miss the opportunity to purchase this harness for your lovely Amstaff dog. 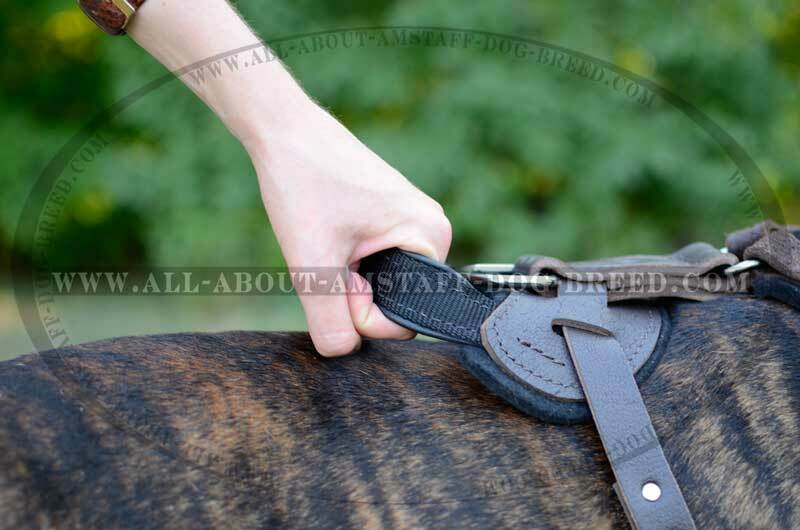 - Take care of the leather to prolong its service life period. 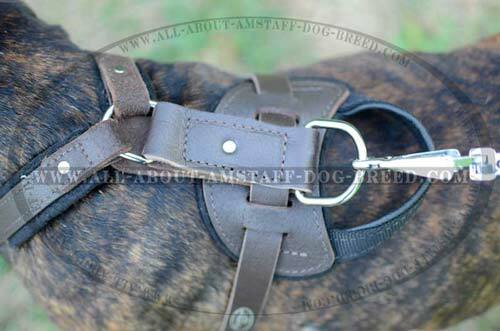 Use some special creams and sprays for leather protection. - Don’t expose the harness to excessive sun rays or water. 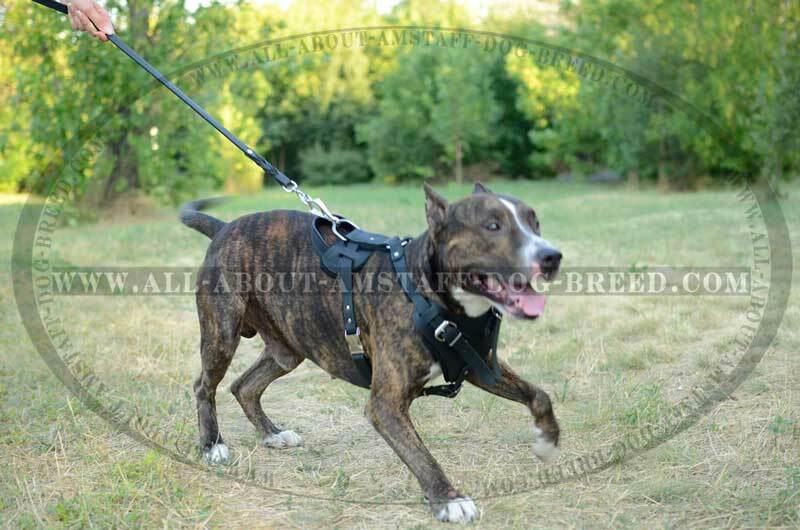 The harness can change its form.